Aspectra Mini (App on Google-Play) is the base application in Aspectra system. actual plot will be saved in file-system. Left: Camera preview, Right: intensity plot. The green lines help in defining Area of Interest. N (wave length) axis, pixels from Start-Pixel to End-pixel. 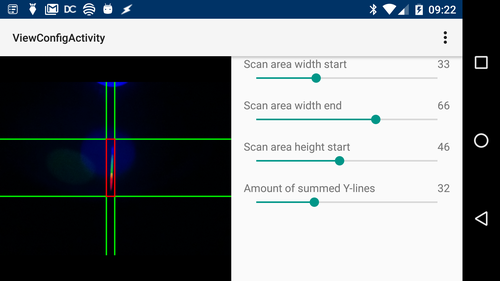 Distance between both red lines defines how many of pixels are taken to calculate the average Y value. Wave-length axis can be vertical or horizontal. it depends on the build of spectroscope. 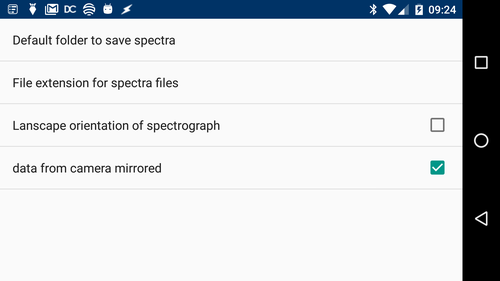 Actual screenshot show the portrait orientation of spectrum. Portrait/Landscape orientation of spectrum should be defined in preferences. Y Value is the Average of M pixels in intensity-axis of camera preview. The positions of sliders define the borders of the Area Of Interest. can be incremented by one. can be defined: 1, 2, 4, 8, 16, 32, 64. The orientation of the spectrograph depends on the construction of the spectrograph, from the angle between the optical-grating and camera-orientation. For the mini-spectrograph, shown here, the orientation is portrait mode.